We started our February meeting under cloudy skies and on damp grounds. After some debate about whether to set up on a less damp patch of earth outside or somewhere inside, we settled outside. The weather turned sunny as the meeting progressed, although the temperature stayed chilly. Sheep Shearing Day at Hidden Villa — April 2nd – Jump on this asap if you are interested in demonstrating. The event is open to the public (for a fee?) if you just want to attend to introduce friends to the end-to-end fiber process. 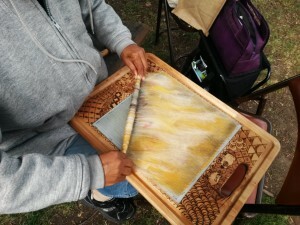 Blacksheep Handweavers’ Guild has a display at the Redwood City Library right now. 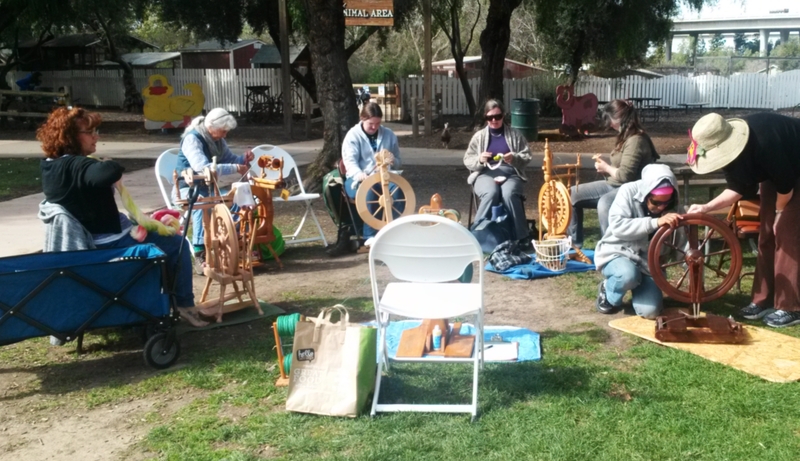 Living History Day at Ardenwood – Ardenwood has a Living History Day in early March. California State Fair – runs July 8 – 24, 2016. 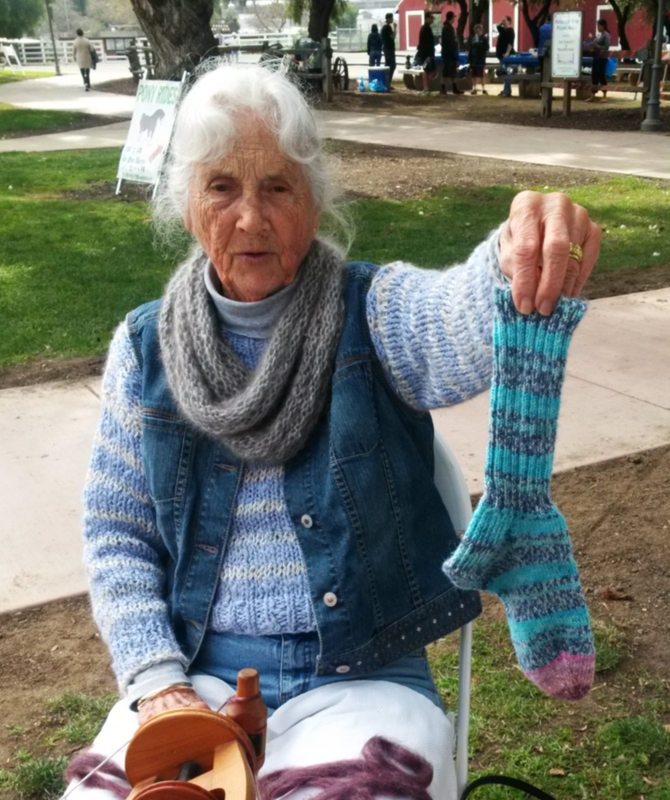 There are classes for hand spun! The deadline for entry paperwork is April 27. Entries are due later and can be submitted in person (in Sacramento) or by mail. visit http://CAStateFair.org/crafts, contact crafts@calexpo.com, or call (916) 263-0989. Highland Games – Labor Day weekend at the Alameda County Fairgrounds in Pleasanton. Lynn, Lynnette, and Sue (Grant) have a booth. Contact one of them if you want to join the fun demonstrating. Jennifer with her horse Ajax will be participating in a Renaissance War (reenactment with jousting etc.). The event itself will span a 10 day period April 29th – May 8th. Contact Jennifer if you want to watch the local practice on April 10. Tall Ships — The Tall Ships that several members have had fun taking trips on are currently touring the bay area. They are currently at the Port of Oakland. From there, they will travel on to Antioch, Sausalito, and the Port of Redwood City. The tall ship Lady Washington featured on TV as the Jolly Roger. We started Show & Tell with Carol Lewis. She’s been binge watching TV while spinning away. Carol is trying to turn big bags of white 2004 vintage Corriedale cross fleece into yarn for blankets. Carol said she had thought she was almost to the bottom of the last bag when she uncovered yet another large bag. Carol had three or four very full bobbins on various holders on her wheel — a token of her spinning efforts. She made a valiant effort during the meeting to finish the not-really-final bag but the bag had an ounce or so more wool than the meeting had time. Carol gave us a heads up on the visiting tall ships and on the California State Fair. Carol had already gone to Stitches. She had succeeded in restraining herself, coming home with only two books and a small amount of yarn. She passed the books around so that we could peek. One was Splendid Apparel. It featured all kinds of ways to embellish knitting. The other was The Modern Natural Dyer. Jennifer brought neither show & tell goodies nor her horse. Emma Prusch Park does not allow guests to come on horseback. She has recently returned from a trip to Kentucky to visit her parents over Super Bowl weekend. Her parents had just packed up to move to Kentucky. Jennifer said she did lots of knitting on the trip. She finished a cowl just before she returned out of teal and other color yarns. Jennifer has two kits with patterns and yarn that she is considering for her next projects. One is for a hooded cowl and the other is for a lacey shawl. Jennifer is also going to be having adventures over the few months practicing for and participating in a Renaissance war with her horse Ajax. FYI: Ajax will be celebrating his 19th birthday this year so he is a senior in horse years. 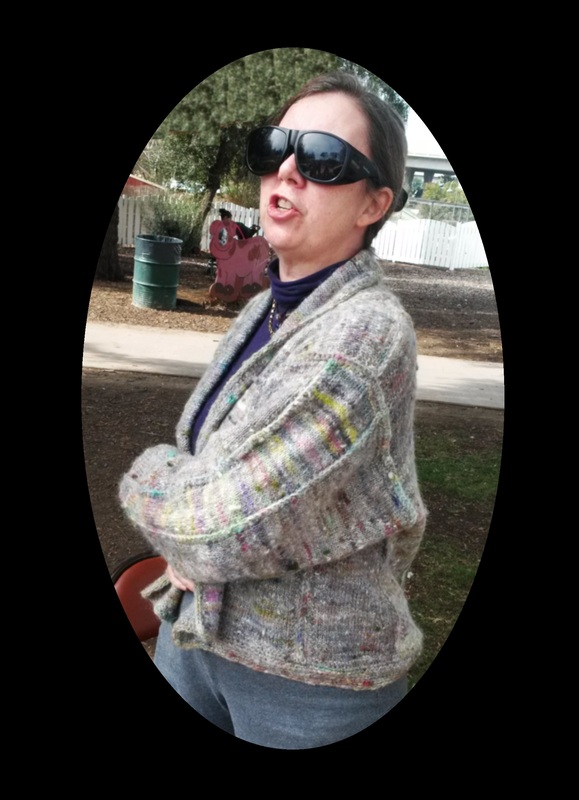 Laura showed off a recently finished sweater that she’d knitted from bits and bobs of her handspun. 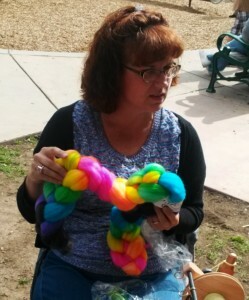 She carefully mixed the yarns to highlight the color variations. All told, she put about 18 ounces of singles yarn into the sweater. Laura spun on a small support spindle during the first half of the meeting then switched to knitting using a technique not commonly seen in these parts. 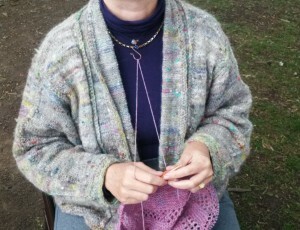 She ran the yarn through a hook on a necklace and worked each stitch with her thumb. Eleanor had nothing to show. She graced us with her company, though. She spun some lovely green heather wool during the meeting. Patti spun some khaki colored fiber during the meeting. The fiber was the present she picked at our Christmas gift exchange of 2015. No procrastinating for her! 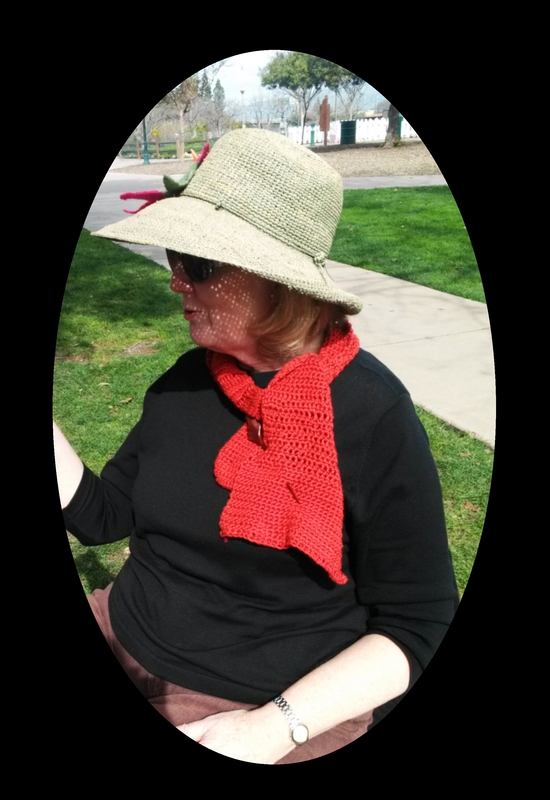 At our meeting, Patti wore her first finished crochet project — a tapered crochet scarf that looked very nice held by a newly acquired shawl pin. Patti, too, had already visited Stitches. She came home with a crochet pattern for the Dowager Shawl – part of the Downton Abbey series — and gray yarn for it. This is a simple crochet shawl. Cookie jumped in and helped Patti puzzle out the directions. Patti had a nice start by the time the meeting ended. 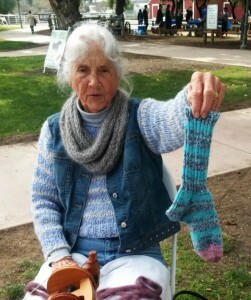 During Show & Tell, Patti shows us a knitted swatch she made at a knitting class she recently took. She now knows how to cast on and how to do the knit stitch. Patti has come a long way since she joined our group, adding crocheting and knitting to her repertoire. Cookie came with the fiber blending board she made out of a cutting board. It is well decorated with sheep and other designs Cookie added using her wood burning skills. After laying out her colored fibers on the board, Cookie found that her doffing sticks were missing. So she switched to spinning up some violet wool on her drop spindle. The wool was dyed at a cochineal class she took awhile back. Silk dyed in the same dye bath came out a rose color. Eventually, Carol dug up a couple of dowels in her kit and Cookie was able to pull rolags off her blending board. 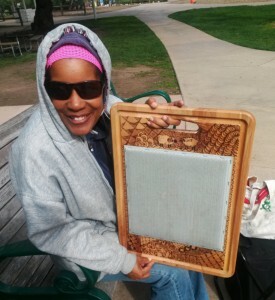 At home, Cookie has been working on crocheting a pair of portraits. One is of her aunt. That portrait is full color, with a deep red background. The other portrait of on Marilyn Monroe, done in gray scale and intended for Cookie’s sister. Ginger has started plying the green wool she was spinning at the past couple of meetings. Ginger is working toward a weaving binge to make a bunch of plaid wool throws. 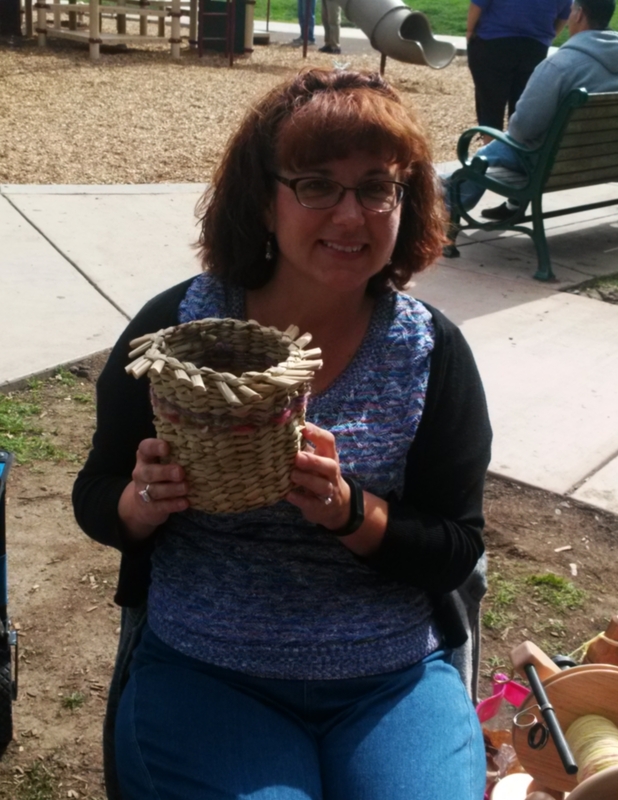 Kelly went to the basket weaving class at McClellan Ranch that was advertised in an email to the guild a month or so back. She came home with a nice basket. The basket has a decorative band near the top made of yarn woven in between the reeds. Kelly also dropped by Stitches West yesterday. She came out with a couple of bags of fiber to spin. One bag was of water shades — blues, aquarmarine, and such. The other bag was of vibrant colors. Kelly wants to learn Navajo aka chain plying so that she can preserve the clarity of the colors in the yarn to be spun from the vibrant assortment. This entry was posted in Uncategorized on February 21, 2016 by Aviva Garrett.